As far as I can tell, the last time I featured Em.Lasker on Top eBay Chess Items by Price was Beating Dr.Lasker in a Simul (February 2013). 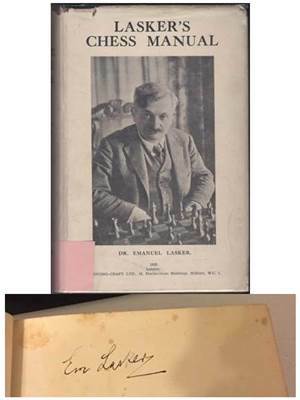 The item pictured below was titled 'Chess book signed by Emanuel Lasker 1932 autograph' and sold for $400, 'Best offer accepted', down from an initial asking price of $600. Hard Lasker's Chess Manual 1932; The Printing-Craft Ltd., London; 349 pages with 308 black & white illustrations.  This chess manual has long been considered one of the most significant works on chess ever written. First revised edition. Lasker's Chess Manual is presented in a unique style and has great historical significance. Typical for Lasker, the focus is on general principles that can be used in a variety of situations, rather than lengthy analysis of a single line or position. First English edition was published in 1927.  A very good copy with an extremely scarce dust jacket. Signed by Emanuel Lasker. Lasker's Manual is an occasional source of inspiration on this blog. See, for example, Lasker on Computer Chess (April 2012), and Thinking about Chess (April 2014).